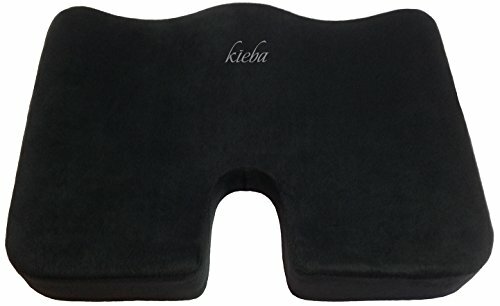 This orthopedic superior grade memory foam cushion will add relief and comfort to any chair, bench, car seat, plane seat, wheelchair, or floor. The specially designed U-shape contour pillow provides relief from pain and tension, and promotes good posture, proper spine alignment, healthy weight distribution, and ultimate comfort. Made from the highest quality memory foam, this cushion will not flatten out from prolonged use like other cushions. The non-slip bottom keeps the cushion in place on any surface. The breathable velour cover can be removed from the rear zipper for easy cleaning. DURABLE: Ultra Premium Therapeutic Grade 100% Memory Foam. Will not flatten out with prolonged use. Non-slip bottom ensures the cushion stays in place and will not shift or slide on any surface.